A quick note: ICYMI (in case you missed it), Amanda S. was the randomly chosen winner of the Spreading WI Love Giveaway. She professes to be “obsessed with all things wine and chocolate”, and plans to try the “secret family recipe” I shared with her. Congratulations, Amanda! Last week, “Stairwell Guy” (Jeff) and I decided to meet for dinner. I was heading to Memphis for friends’ wedding over the Valentine’s Day weekend, so we opted to have a nice dinner on the Tuesday night prior. I lost our Superbowl bet (thank you Denver Broncos for that! ), so dinner was going to be my treat. I think “Stairwell Guy” is the only person I know that is more indecisive than I am; so when my friend Phi reminded me of her and her husband’s favorite restaurant in Milwaukee (The Noble), I texted Jeff and offered it up as a suggestion. He checked the website and thought it was a great option. So, we met at my apartment (in East Town) and drove a few miles down to Walker’s Point to enjoy our first dinner at The Noble. The Noble is a small and unassuming joint, both inside and out. Phi had warned me that the restaurant doesn’t accept reservations and only has six or seven tables. For these reasons, I felt like heading over there on a chilly (okay, downright cold) Tuesday night was a wise choice. We were greeted warmly by the staff and were seated right away. The tables, like the general atmosphere, were simple, yet inviting. 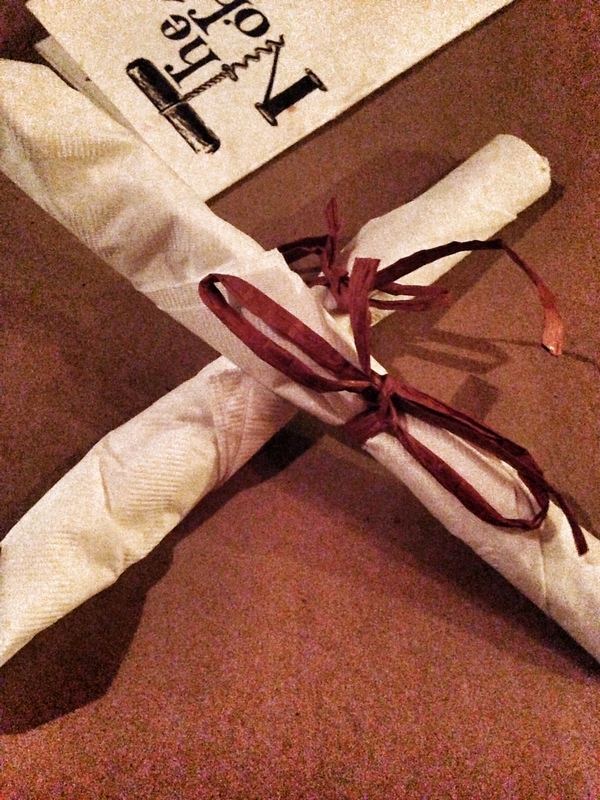 Brown paper over white linens and silverware wrapped in paper napkins, but tied with sweet little bows. Jeff and I opted for hot tea as our beverages – we needed to warm up after the brief walk in the cold Milwaukee winter air. I didn’t even check the drink menu, but the bar in the restaurant gave me the impression that one could order some really delicious drinks if one wanted to do so. After perusing the small menu, which consisted of some wonderful appetizers and salads as well as nightly specials of the “Hunters” (meat dish), the “Gathers” (vegetarian), and the “Middle of the Road”, I decided I really couldn’t go wrong with anything on the menu. Jeff decided to have the tomato and roasted red pepper soup to start. 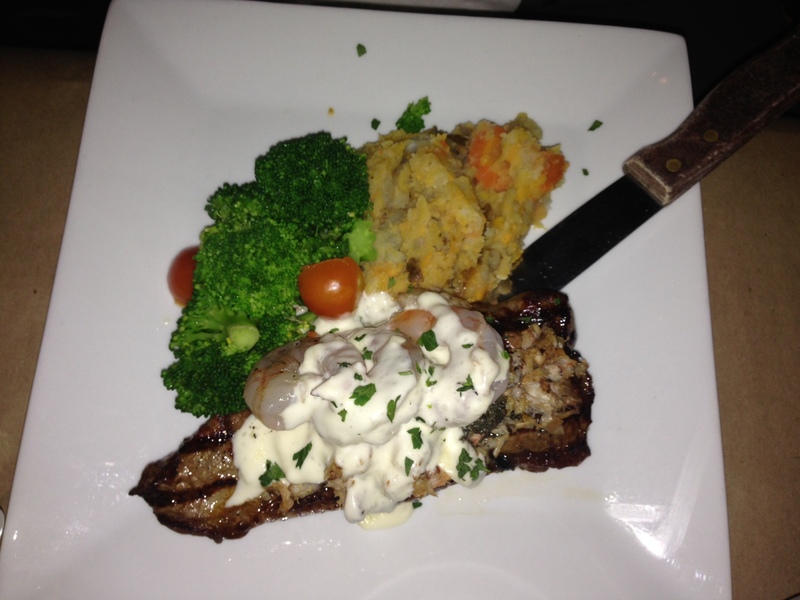 He then decided on “The Hunters” special, which was a NY Strip steak covered with crab meat and shrimp in a cream sauce for dinner. Since I was so confident in the menu, I simply asked our server, Amanda, to choose her favorite dish for me. She was a bit startled (as was Jeff), but she quickly agreed to take good care of me. Jeff’s soup came out quite quickly and was a large bowl of thick, creamy soup with wonderful flavor. (I failed to take a photo). We chatted as we soaked in the eclectic atmosphere, and before we knew it, our entrees were served. Jeff’s was set down first, and it looked spectacular! Amanda told me that she chose the “Middle of the Road” special, which was Beef Stroganoff, because “it’s the perfect meal on a cold winter night”. I definitely liked her reasoning, but honestly, after seeing Jeff’s plate, I was kind of wishing that I had gotten the NY Strip. 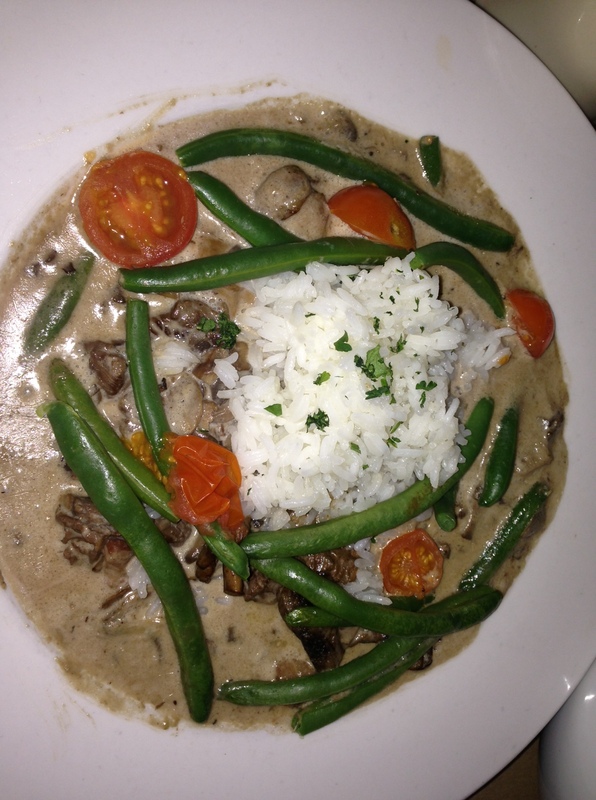 That was…until I tasted the Stroganoff. As you can see, it was served with rice, green beans and tomatoes. The sauce was creamy and light, but still very rich. It was a different take on Beef Stroganoff for me – mom had always made it over egg noodles and sans vegetables (well, veggies on the side, but not in the dish!). I only managed to finish half of the dish, but was excited about the prospect of freezing the other half for dinner at a later date. I remember that there was a blackberry bread pudding special, and something else being offered up – but I cannot remember the details after hearing Amanda talk about an orange cake with chocolate ganache, fresh whipped cream, and chocolate shavings. Y’all, I will eat chocolate on the regular, but given the choice, I’ll pass it up for an orange flavored dessert almost every time. So, pairing the two? Genius! Jeff actually spoke up and ordered that, knowing how much I like orange desserts (and, he has a massive sweet tooth that never quite seems satisfied). 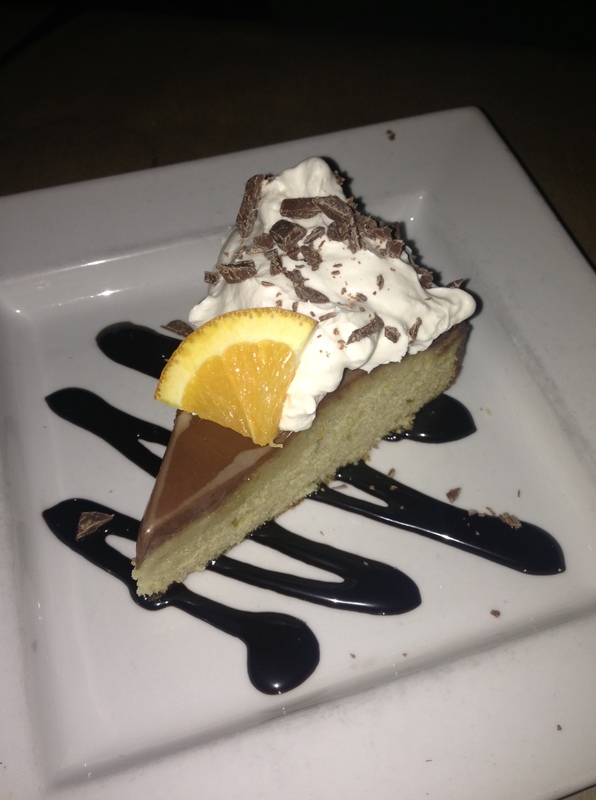 It took us no time at all to dive into this delicious dessert, and only a few minutes to completely clean the plate! This may be a dessert I need to attempt at home. Or, perhaps I’ll have my friend Katie, of Katie’s Adventures in the Kitchen give it a whirl! It is BY FAR my favorite dessert in the past several years. 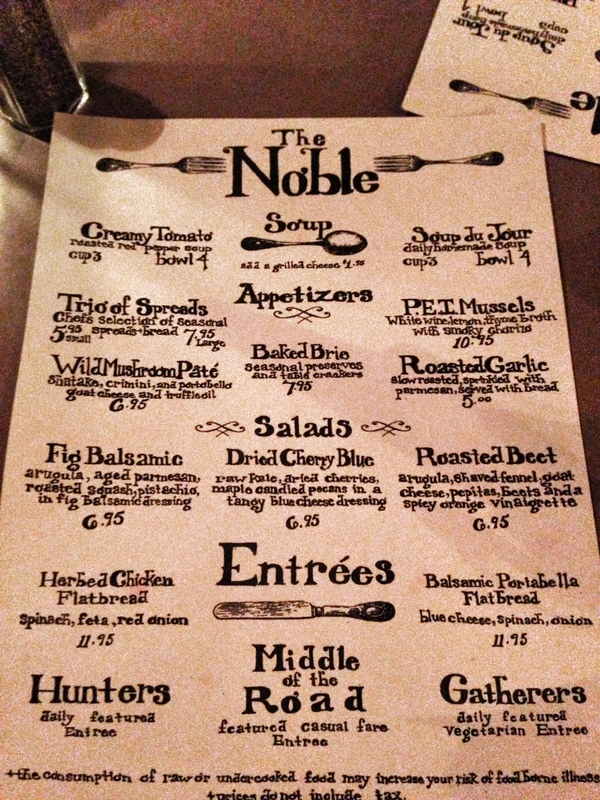 I want to thank Phi for the recommendation to check out The Noble. I’m thinking we should go back and enjoy dinner together sometime! I love your overview of your experience at the Noble! So perfectly put the way you described everything!! After reading this I am thinking we DEFINITELY need to go back together-every time I go there (which is quite often) I fall more and more in love because the food is delicious! My favorite drink there is this delicious grapefruit martini called ‘the pink drink’ ! You were spot-on in terms of your description and recommendation, Phi. Let’s plan a date to dine at The Noble together! Did my parents ask you to write that, Rich? 😉 Maybe I’ll snap a photo at our dinner out with Phi in a couple of weeks. He just doesn’t really exist on the Internet, so I don’t want to be the person to put him out there! Thanks for reading the post and for paying me the compliment!